Hyuk-Jin (Song Sam-Dong) has just broken up with his girlfriend and goes out with his friends for a night of drinks. During their evening, the guys decided to make a trip out to Gangwon-do in the morning. The next day, Hyuk-Jin's friends are all too hungover to go, so Hyuk-Jin decides to make the trip alone. His trip quickly turns into a series of misunderstandings and crossed paths. Ki Jul 15 2009 10:10 pm Koreans love their soju & the highly amusing indie film “Daytime Drinking” wraps an entire road film around the popular working class drink. The film also marks the debut for talented screen writer & director Yeong-seok No. 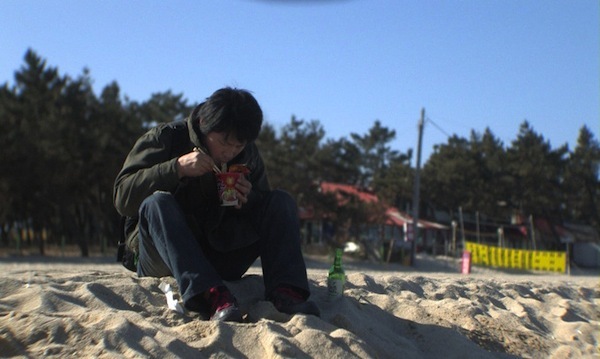 Like a lot of Korean indie films, “Daytime Drinking” weaves its tale in a road film setting, but most surprising for its genre the film offers consistent doses of cringe worthy laughter. Quite often you feel so embarrassed for the main character Hyeok-jin that you can’t help to laugh at him or with him. The film also features a view into small town life in South Korea that’s not shown in many commercial Korean films. 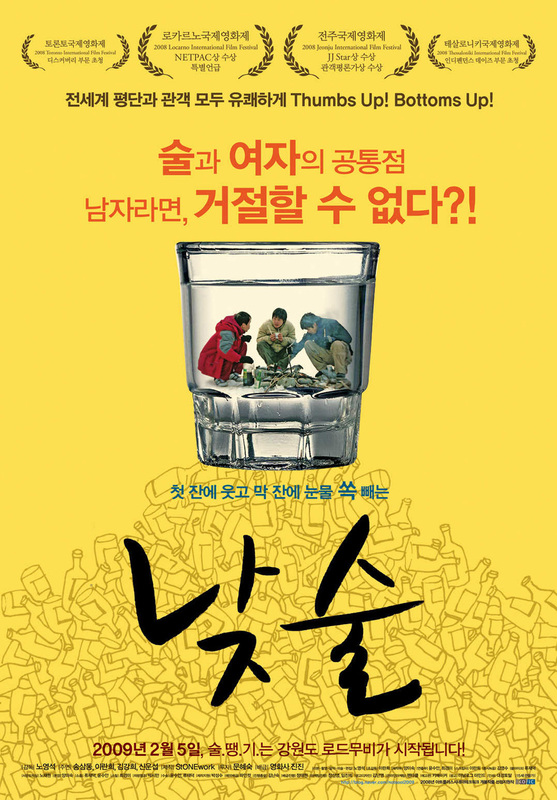 In “Daytime Drinking,” broken hearted Hyeok-jin (Sam-dong Song) drowns his sorrows with three of his friends in a comfortable neighborhood Seoul bar. 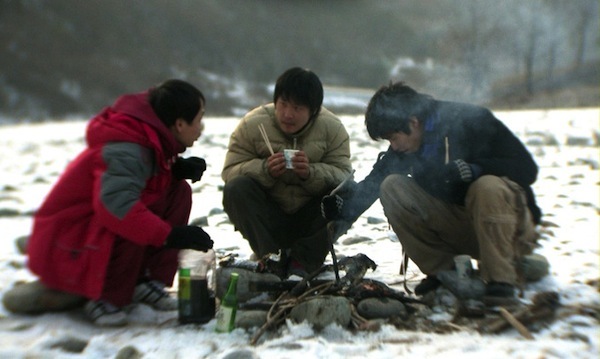 The group decides on a drunken whim to take a road trip the next day to Gangwondo. Unfortunately, all of Hyeok-jin’s friends oversleep the next day. 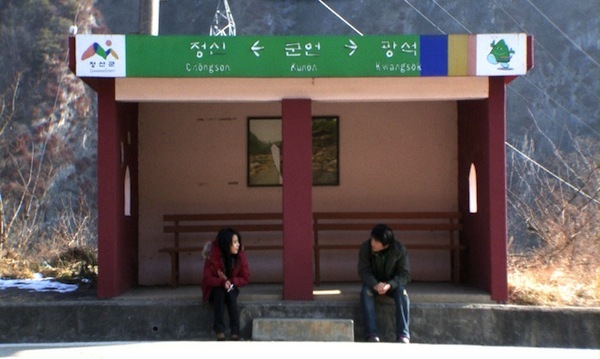 Hyeok-jin now finds himself all alone at the meeting point in the rural town of Jeongseon. Rather than return home, Hyeok-jin goes along with the advice of his friend, who apologizes incessantly over the phone and promises to meet him the following day. His friend recommends to Hyeok-jin to stay at a nearby inn run by an acquaintance of his. Hyeok-jin’s adventure is then just about to begin …. The character of Hyeok-jin, played by Sam-dong Song, is a timid guy that can’t quite say no to anyone and because of this, finds himself in many uncomfortable situations. At the inn where Hyeok-jin first stays, there’s an odd (but attractive) young girl staying in the next room. He’ll cross paths with her quite a few times. Then there’s an equally strange lady he meets on a bus. She recites Japanese poetry and offers to accompany Hyeok-jin to the next town. He’ll cross paths with her quite a few more times as well. There’s also a very creepy truck driver that Hyeok-jin won’t want to meet ever again. All of these moments happen naturally, with plenty of laughter occurring along the way. Every time Hyeok-jin comes across a new person you can bet they’ll spend their time drinking “soju” and getting into trouble. While the movie flies by for the first 90 minutes on its unpredictable path, the film does start to feel long in the tooth by the last act (when Hyeok-jin’s friend finally picks him up). An extra 30 minutes feels tacked onto the film which could have been shortened or excised completely. With that said, “Daytime Drinking” is still one of the finer Korean indie films you’ll likely see this year (haven’t enjoyed a Korean indie film like this since “Boys Of Tomorrow”) and its certainly worthwhile for all Korean cinema fans to check out. The only caveat with “Daytime Drinking” is that if you’re a recovering alcoholic than this film isn’t for you, as you’ll find yourself licking your lips way too often.